Home › Blog › News › Fifteen detect a winner with Ramtech! Fifteen detect a winner with Ramtech! The creative team at Fifteen Design are pleased to unveil our latest campaign for Ramtech Electronics. 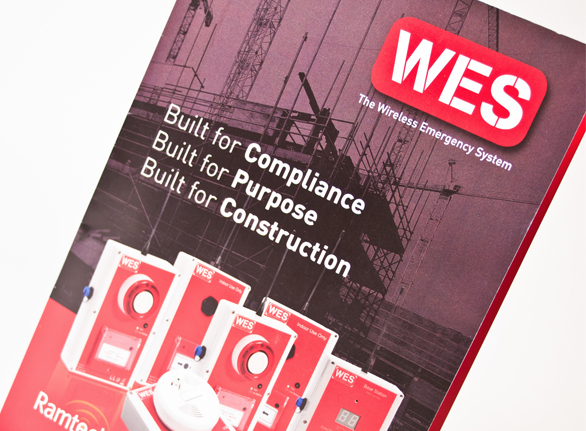 Ramtech have launched their ‘WES’ range of products. Specifically aimed at the construction industry, Ramtech produce wireless fire alarms and fire detection systems which comply with the stringent health and safety rules surrounding the area. Their wireless system is unparalleled and they wanted to shout about it! Cue Fifteen Design. Ramtech were keen to showcase not only their ever growing range of products, but also highlight the benefits of their wireless system and health and safety compliance. Our latest work for Ramtech includes a comprehensive brochure featuring their full range of WES Safety devices on the cover. The brochure is stunning in a red and black theme throughout. As well as their brochure, Fifteen Design have also designed a suite of HTML emails for Ramtech to send out to their database of customers. The email campaign of 4 months updates customers on the latest devices launched and of projects that Ramtech have been working on, including the Olympics Site. The response from the HTML email campaign has been outstanding and Ramtech are thrilled with the work Fifteen have produced for them.